An ancient evil spirit named Animus is awakened by its followers and travels to Jerusalem where it steals “The End of Days”, one of the Dead Sea Scrolls. April and Oyuki arrive in Israel with two large trunks in tow. The women take a taxi to a local hotel and we discover that the TMNT, Ninjara and Master Splinter were hiding in the large luggage. Shortly thereafter, a young military Private named Ariella Yahuda arrives and tells April that she’ll be their tour guide for the Old City the following morning. Once Ariella departs, the TMNT have a big pillow fight while Master Splinter turns on the news. The broadcast shows a huge fight taking place on the streets of Old City, where tourists and citizens are fighting a pitched battle with one another. Also in the melee are Al’Falqa and Katmandu. Our heroes hurry out to investigate the violence, but April and Oyuki are met by Ariella, who tells them that they must stay at the hotel until the fighting has stopped. The TMNT have other plans and escape through a window. 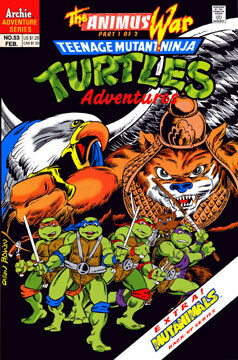 The Turtles make it to the heart of the battle and discover that everyone involved is possessed – all of their eyes are blank white. Mike spots someone throwing a molotov cocktail into a car. The Turtle tries to retrieve it before it explodes, but he’s too late and is caught in the blast. Meanwhile, back at the hotel, Ariella spots the smoke from the car fire and transforms into a super-powered being named Golani before setting off in the direction of the explosion. Additional Content: 6 page Mutanimals story by Clarrain, Brown, Talbot and Lawson.